Can anyone identify the ships in this scene? Divided back. 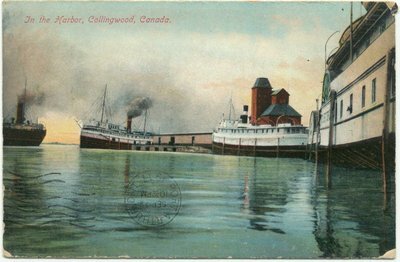 Postmarked "Port Arthur, 22 Sep 1911 10:30 pm"
"In the Harbor, Collingwood, Canada"
Reverse: " Published by Stedman Bros., Brantford, Canada. Made in Germany 655"